From left, chapter president John Saito, scholarship recipients Jeffrey Fujimoto and Emily Lui, and 2014 Miss Western L.A. Steffi Fukunaga. The West Los Angeles chapter of the Japanese American Citizens League announced its scholarship winners recently. Jeffrey Fujimoto, a third-year medical student, was awarded the $2,500 Chiyo M. Hattori Scholarship, designated to an outstanding student pursuing an education in medicine. 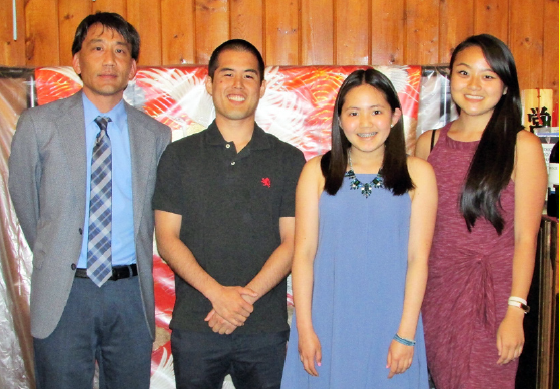 Emily Lui and Makito Takahashi were recipients of the Jack Nomura High School Scholarship. Fujimoto completed his third year at the David Geffen School of Medicine at UCLA. The son of Sally and Greg Fujimoto of Los Angeles graduated from UC Berkeley with a degree in bioengineering and is a five-time national champion in judo. Over the next two years, Fujimoto will complete an MBA and his remaining medical school training and plans to become a physician executive who will drive innovation and change in the health care system while also providing direct patient care. Lui graduated with a 3.97 grade point average from Venice High School and will attend UC Berkeley in the fall. The daughter of Susan and Mark Lui of Los Angeles, she was a competitive figure skater who was active at school in theater, academic decathlon and robotics. She also served as president of the West Los Angeles United Methodist Church’s youth group. Takahashi graduated from New West Charter High School and attended the Japanese Institute of Sawtelle for 13 years. The son of Keiko and Toshio Takahashi of Culver City, he was a member of several school organizations, including the anime, art, gay and straight alignment and cross country clubs. Takahashi, who was also a member of the West L.A. United Methodist Church youth group, will attend Humboldt State University. Each high school awardee received $750. The scholarship is named in honor of the late Jack Nomura, longtime chapter board member.